An acoustic investigation of the Cape Bridgewater Wind Farm was required to address the disturbances to specific local residents. The normal descriptors of noise and vibration did not fit the disturbances so described. The introduction of sensation as a descriptor was given universal approval. The study involved recording observations that included the concept of sensation as many of the complaints were not related to noise. The inclusion of the severity of sensation to describe wind farm impacts has not occurred before. “Sensation” ended up being the major disturbance identified by the residents. The ranking of unacceptable impacts that would cause the residents to leave their homes at the time was as a result of sensation that in turn has resulted in a new descriptor dB(WTS) being proposed. The development and use of sensation in the study is discussed. To date the general acoustic index used in assessing wind farm impacts is that associated with the dB(A) value and incorporates a frequency weighting that is normally expressed as approximating the human ear. 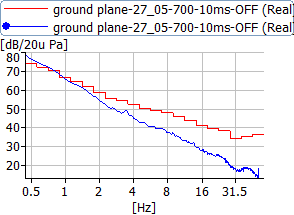 The dB(A) parameter is used for general acoustic assessments but has limitations with the correlation of subjective loudness by reason that the response of the human ear across the various frequency bands changes for different ranges of sound pressure levels. Originally on sound level meters, some 30 to 50 years ago, there were different filters (A-weighted, B-weighted, C-weighted and Un-weighted) to address the different frequency response of the human ear relative to the sound pressure level. The dB(C) is for the higher levels of sound pressure being a flatter response than the A-weighted curve, but not a flat response. 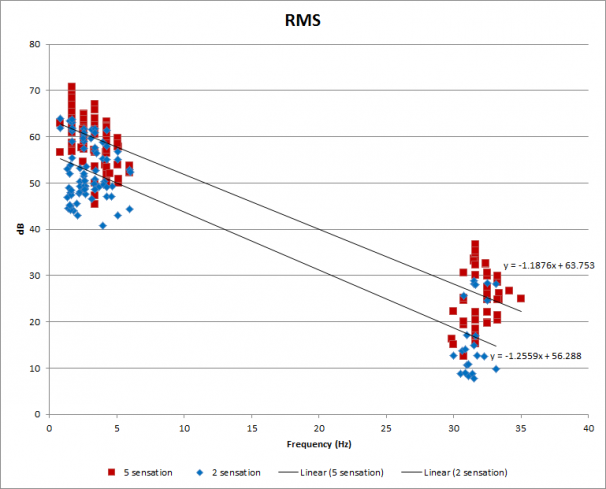 An issue with respect to the A-weighted value is that the roll off in the curve at low frequencies provides a bias in the overall A-weighted value around the mid band frequencies. In the case of wind farm noise the sound generated by industrial wind turbines, that are typically placed in rural areas, is that the noise at such residential receivers is not reflected on a subjective loudness basis in the A-weighted value. Often when noise can be heard it may be described as a low frequency noise or an intermittent noise. The use of an Leq 10 minute parameter, or an L90 parameter (with an assumed Leq level say 1.5 dB above the L90 level) does not account for the subjective nature of a varying noise. In many instances complaints by residents in relation to disturbance from wind farms indicates disturbance is not restricted to noise. The complaints may include vibration, headaches, nausea, pressure in the head throat or chest, or sleep disturbance. Not all of these descriptions tend to fall into a “noise” category, or in particular the dB(A) level that may be “measured” or “predicted” to be generated from a turbine installation. 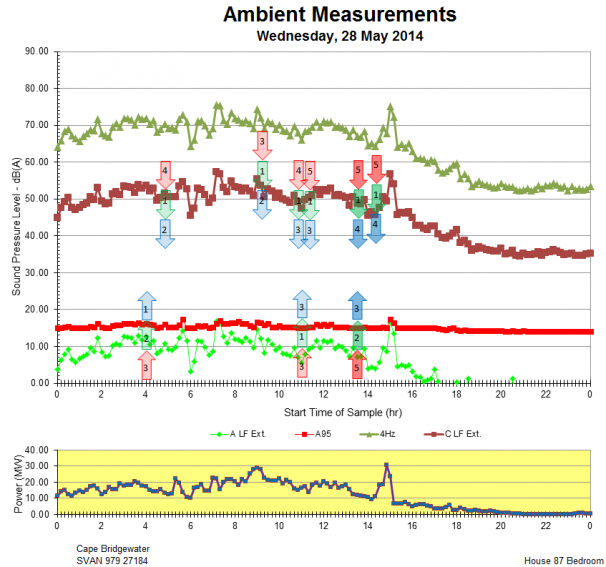 During a “study” of the Waterloo Wind Farm undertaken by the South Australian EPA , testing was undertaken by the author at some residential properties (also tested by the EPA) by way of unattended noise loggers supplemented by attended measurements. The residents participating in the EPA study were requested to fill out a diary format with the specific identification by the EPA in the Noise Diary “any reference to noise means audible noise”. During the attended measurements at various households where measurements were conducted by the author inside and external to the dwelling (separately and in some cases simultaneously), the residents were requested to advise whether they could perceive the operation of the windfarm. If they could identify the operation of the turbines they were asked whether they could hear the noise. As a result of the various questions being posed to a number of residents throughout the day and night, when monitoring was being undertaken, it was ascertained that for the majority of the occasions the residents could identify the operation of the turbines by way of a “feeling” or “sensation” but not audible noise detected inside the dwelling. This is a similar result to that identified by some of the acoustical engineers involved in the Shirley Wind Farm investigation . Examination of the monitoring data to coincide with the questions being asked revealed as a general concept that there was no correlation with the A-weighted level versus the sensation perceived by the residents. However, on a narrow band FFT analysis the individual frequencies associated with the multiples of the blade pass frequency in the vicinity of 4 and 5 Hz when over 50 dB (as an RMS level) was for those residents the threshold of the sensation perception. When the internal narrowband levels were below 50 dB then there was no perception of the operation of the windfarm, even though the discrete frequencies associated with the blade pass frequency could still be measured using a Bruel & Kjaer LANXI Pulse System with 4193 microphones. The pattern associated with the blade pass frequency and the multiple harmonics of that frequency has been previously described by the author as Wind Turbine Signature (“WTS”), not to be confused with a generic descriptor that is used elsewhere of Wind Turbine Syndrome. At the time of those observations the author had conducted measurements at eleven different windfarms (some windfarms having months of measurements) and consistently found when the wind farm was operating the Wind Turbine Signature was present when utilising narrow band FFT analysis. Restricting measurements to 1/3 octave bands does not reveal such patterns due to the width of the 1/3 octave bands merging of individual discrete frequency components found in the narrow band analysis. Figures 1 & 2 (from the Cape Bridgewater wind farm study ) highlight the benefit of narrow band analysis versus 1/3 octave band measurements, where all the results are 10 minute energy averaged (Leq) rms levels (narrow band 400 lines, 0-50Hz), for an external location using a ground plane microphone. 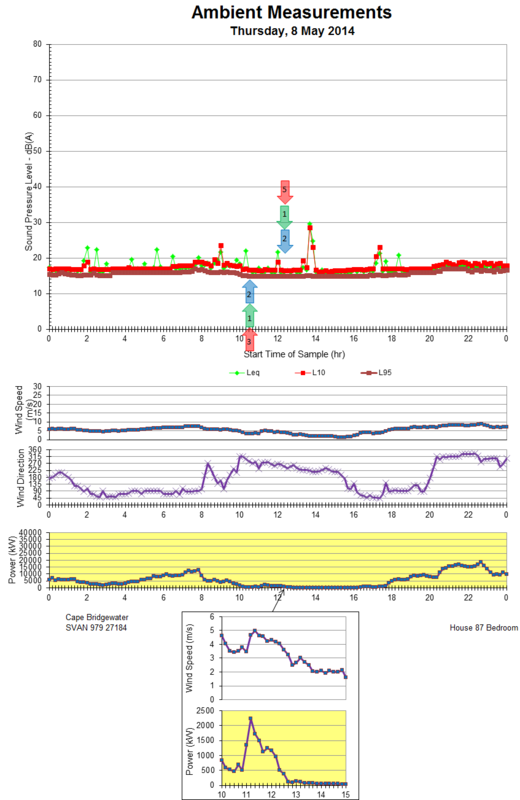 An examination of literature reviews and noise assessments associated with wind farm noise did not appear to disclose any identification or sensation or feeling, with the exception of the work by Dr Kelley in 1982  where by the use of a single large two bladed turbine Dr Kelley and his team established a correlation between sensation/feeling perceptions and the subject turbine. It is noted that at the time of the author’s Waterloo measurements (in May 2013) the Kelley material (from 1982)’s was unknown by the author. It was only after discussing the preliminary findings of sensation as a result of the Waterloo testing and the perception threshold concept with another acoustician in the US, who remembered the standing wave vibration results by Hubbard and Shepherd  that in turn led to an identification of the Kelley material. The report issued by the South Australian EPA with respect to the Waterloo windfarm testing provided a summary of the resident’s logs, but not the actual logs themselves. With the residents’ permission an analysis of copies of the logs was undertaken by Mary Morris (local resident and author of the Waterloo resident survey ) to find a significant proportion of the observations as to disturbance identified by the residents that were participating in the EPA study were not related to noise, and were subsequently ignored by the SA EPA . To address the issue of complaints from residents at Cape Bridgewater, Pacific Hydro requested the conduct of an acoustic study at three residential properties to determine whether certain wind conditions or certain sound levels give rise to disturbance experienced by specific local residents at Cape Bridgewater. The study was to incorporate three houses that are located between 650 m to 1600 m from the nearest turbine. The Pacific Hydro brief was specific in only using the three houses (no control group or a wider sample), no medical studies, no assessment of the health impacts and no evaluation of compliance with the permit conditions (regression analysis). The acoustic investigation into complaints from six residents in proximity to the Cape Bridgewater Wind Farm in south-west Victoria (Australia) was carried out between April and July 2014 . The investigation was commissioned by the Wind Farm operator with specific instructions that it was to be an open and transparent investigation with no restrictions. Furthermore unlimited access to the wind farm (subject to safety requirements) was available, in addition to the operating data of the wind farm throughout the entire survey. The initial concept for obtaining resident’s observations during the monitoring was to use the SA EPA Waterloo questionnaire format. Prior to undertaking the study the residents were requested to carry our preliminary observations in accordance with the SA EPA procedures. Feedback from the residents revealed the questionnaire to be ambiguous in certain areas. Of significance was that the SA EPA procedures did not provide a method to facilitate the recording of the impacts they were experiencing, in that all the residents reported impacts other than noise. Discussions with the Cape Bridgewater residents (in the study) as to what impacts they perceived when the windfarm was operating revealed similar descriptions to that of residents in proximity to other wind farms that would be better described as “sensation”. When these perceptions were grouped together as “sensation” resulted in the residents forming the view that if the questionnaire had three categories of impacts being noise, separately to vibration, and separately to sensation, then those classifications provided a practical method of recording their observations. In addition to the three classifications of observations for the range of the severity of impacts the descriptors provided by the South Australian EPA presented some difficulty to the residents during the trial period. The use of a severity ranking of 1 to 5 used by AECOM  was considered by the residents to be a more workable and an easily understood ranking of severity to that nominated by the SA EPA. Before the survey could commence assurances were required that the individual observations provided by the residents would remain confidential and not be provided to the wind farm operator or anybody outside of our firm, without prior approval of those residents. With the possibility that the ranking of observations could be passed to a third party to undertake statistical analysis of the observations, the diary concept was broken into two pages per day. The date, time, and ranking for the three impacts would be provided on the left page. The right-hand page was available for individual comments as to detailed description of the impact, blood pressure, pulse, weather, or any other observations that the residents considered was relevant. The use of two pages permitted (if statistical analysis was required) only the left hand page to be provided with the highly personal information not forwarded to external parties undertaking a statistical analysis.. The conduct of the Cape Bridgewater study involved external and internal noise monitoring on a continuous basis for eight weeks, including a period of two weeks in which there were total shutdowns of the windfarm during the day, for the purpose of high voltage cabling work in the main substation. The methodology of the study, due to limitations of wave file storage of individual loggers, and the need to review and analyse material on an ongoing basis, resulted in a site visit being carried out every two weeks to retrieve data and discuss with each resident their observations and comments in their diary, rather than the concept of waiting until the end of the entire project to review the material and come back and discuss the diary observations that would have occurred some considerable time after the observations were made. It was considered of significant benefit to review the comments and discuss the progress of the study with the residents throughout the project. Residents have advised that in the Waterloo case the SA EPA did not undertake any such exercise with the residents filling out diaries, whereas monitoring undertaken by the author and monitoring undertaken by Adelaide University specifically set aside time for discussing the results and observations of the residents during the EPA study to gain an insight into what the residents were observing. The initial concept for the study was to consider noise monitoring with respect to the general dB(A) criteria used for windfarm assessments. With the benefit of turbine output data, together with wind speed and direction for each individual turbine, the background level (L95 to accord with the Standard applicable to that windfarm), Leq level and L10 level was plotted for each individual day. In addition to the A-weighted data, the wind speed wind and wind direction (being the average of the individual turbines over a 10 minute measurement period) and the total power output of the relevant section of the windfarm of concern were plotted. Utilising that form of graphical representation the methodology derived for expressing the different severity ranking from the residents was to superimpose arrows, where blue represents “noise”, green represents “vibration” and red represents “sensation”, with the number within each arrow showing the severity ranking reported by the residents. As each household had two residents providing diaries, one resident was represented by an arrow pointing downwards and the other resident an arrow pointing upwards. The relationship of the male and female respondents with respect to the three houses was altered so as to not have any consistent pattern of the downward arrow been a female and the male being the upward arrow, or vice versa. For the house that has been abandoned by the occupants, for the purpose of the study those residents attended their property as much as possible throughout the study period to provide input to the diaries. If located on a separate property within 10 km of the windfarm their observations were noted but only the observations made whilst on the property were used in the study. Plotting the resident’s observations with respect to the A-weighted noise levels did not find any clear and obvious patterns with respect to the operation of the wind farm. 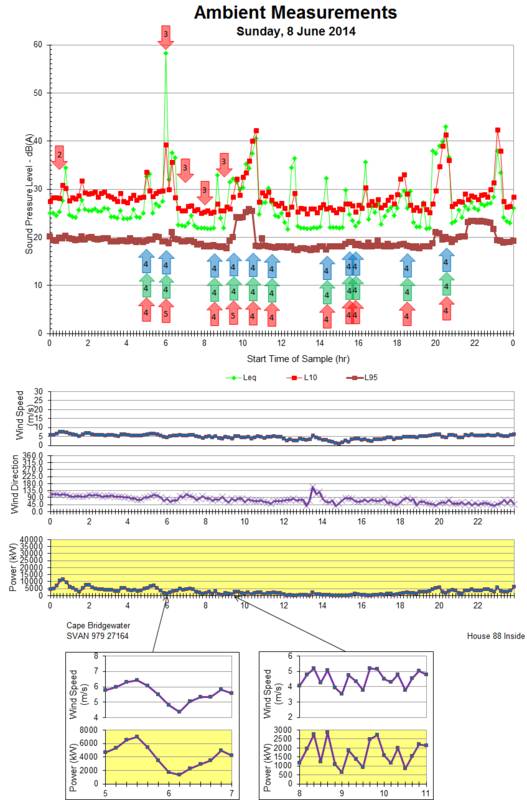 However when viewing those observations with respect to wind speed/direction, and the power output of the windfarm, it was found there were number of operating scenarios that appeared to exhibit a trend in high sensation severity that tended to be related to change in the power settings. On closer examination it appeared that the residents were not reporting their observations on a regular basis but only when there were changes that they perceived. On attending a meeting with the residents after the first set of data had been analysed in terms of their observations and the wind farm power output it was suggested to the residents that the reporting of their observations were only related to changes that they perceived, whereas there was an assumption/expectation the observations would be of the operations and not just changes. All the residents (discussed on an individual basis) agreed that their observations in the diaries were for changes, not observations on a regular basis. All the residents identified that as they had been experiencing the impact of the turbines in excess of six years they were acclimatised to the general feeling/perception and were unaware they were only noticing changes. This could be similar to the concept of having a mild toothache that is there all the time and as such fades into the background of one’s consciousness to only become more apparent when cold, heat or additional pressure is applied to the tooth to generate pain and awareness of the tenderness of the tooth. Such a concept was acceptable to the residents in describing their reporting of the observations. As a result there was a request for the diaries to be a regular reporting of the impacts on a one or two-hour basis, where possible, with the acknowledgement that such reporting would place additional demands on the residents. All the residents agreed that where possible they would undertake such an exercise, but obviously when they were not present at the dwelling that exercise could not be undertaken and there would still be gaps in the data. Discussion with other consultants who had been involved in measurements and social surveys for wind farms found that they too were under the general apprehension that residents would provide observations on an ongoing basis not necessarily restricted to changes. On contacting the residents at which the author had attended during the Waterloo study, and conducted monitoring, found in all cases the residents had unconsciously been reporting observations that related to changes in what they perceived, not regular observations. The survey questionnaire was therefore modified to be that that is shown in Attachment 3. Under the modified Cape Bridgewater questionnaire that was developed with the residents, sensation was found to be major observation (63%) that was reported. The previous observations as to changes related to the wind farm power output were still apparent. It is noted that the assessment was taken from the view of the observations and first compared with the dB(A) noise levels and the wind farm power output. There were no patterns associated with severity and the A-weighted results. However, there were patterns associated with the power output of the wind farm, see Figure 3. Figure 4 shows the internal measurement (bedroom) on the A-weighted noise floor of the meter. During a portion of the measurements the residents (located inside the dwelling away from the bedroom and unable to view the turbines) reported a period of high sensation severity. Subsequent analysis of the wind farm data found a noticeable change in power output (loss of wind) to coincide with the reported sensation. 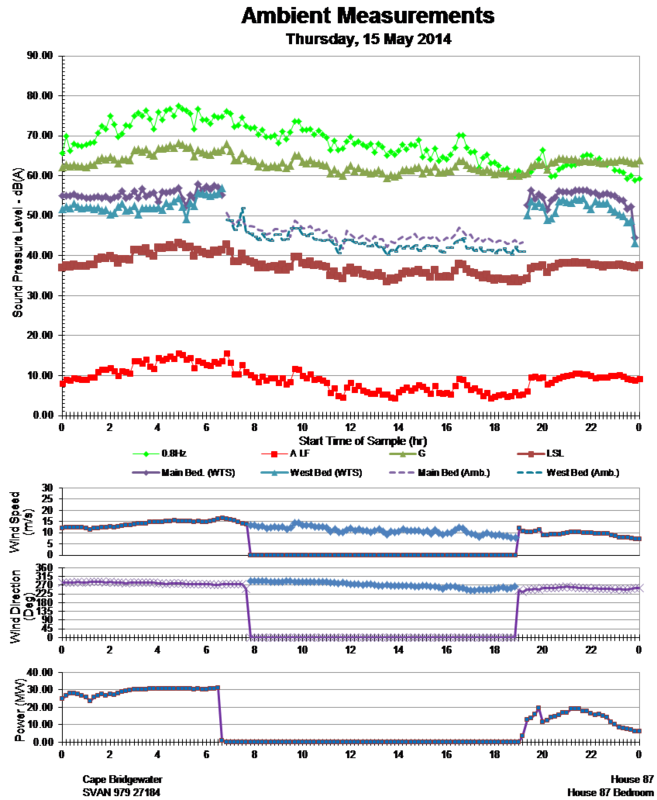 The expanded view of the wind farm average wind speed and power output shown in Figure 4 and Attachment 1 includes periods of high sensation. when the windfarm is maximum at power and it would appear that any further increase in wind speed would lead to the de-powering of the turbines. Having identified the first part of the brief, wind speed conditions that agreed with residents observation (classified as high sensations), the next stage of the study was to ascertain certain sound levels that gave rise to disturbance. Using the full spectrum 1/3 octave band data and assessing different type of acoustic parameters there were no certain sound levels to agree with sensation. What was found was a very good correlation of a number of acoustic parameters versus the wind speed. However, when using narrow band analysis the WTS became apparent with high sensation. With the benefit on ON-OFF testing (a complete shutdown of the wind farm by disconnecting all power to the wind farm) clearly showed the presence of the WTS when operating and the absence of WTS when the wind farm was shut down. 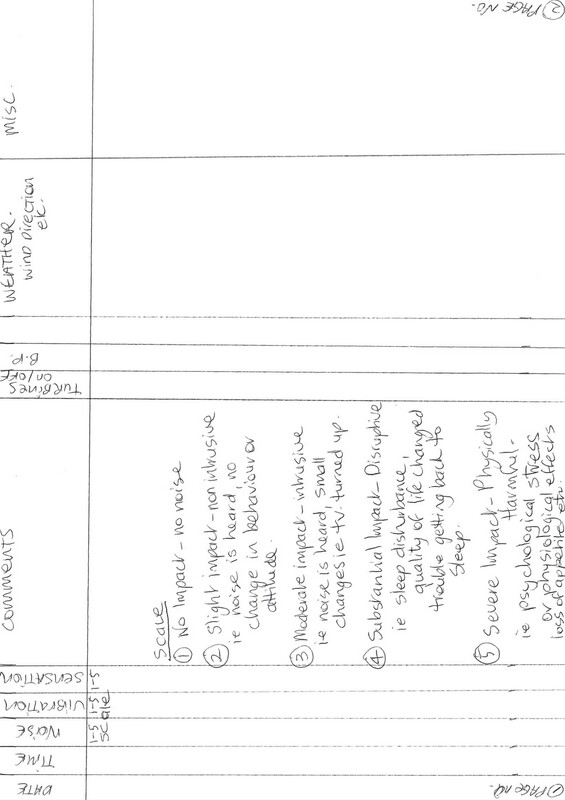 To address the second part of the brief the worst case scenario (severity 5 in terms of sensations for which the residents wanted to leave their home) the wind turbine signature was used (see ref ,  and  for more detail. As a result of the observations a curve based upon the sensation severity 5 level using the narrowband analysis for the WTS (normalised to 10Hz) was derived as an acoustical parameter (figures 51 & 52 in ref ). 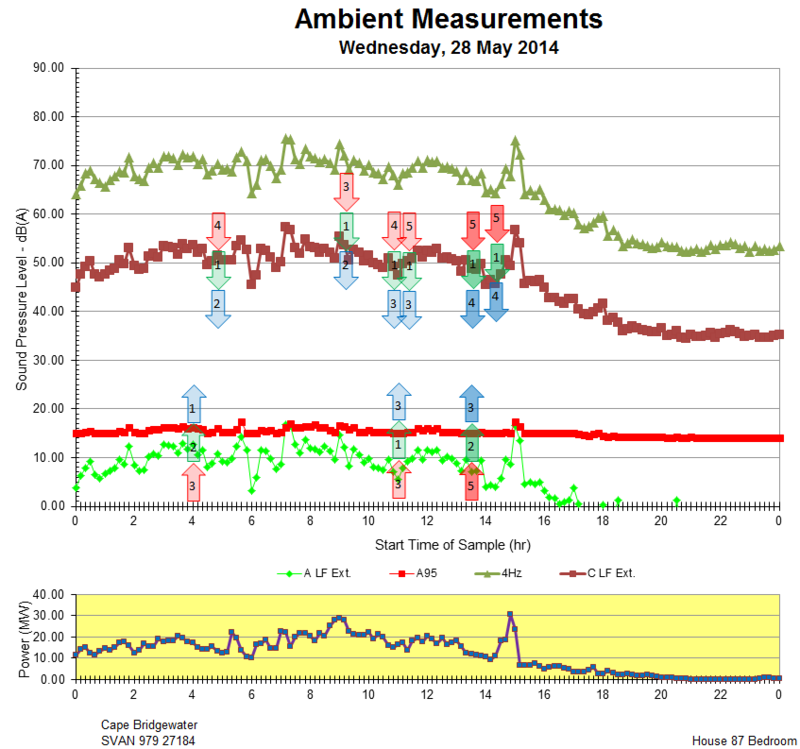 Attachment 2 shows the internal measurements results for a day on which there was a total shutdown of the wind farm. During the course of shutdowns (as part of the study) some residents reported low – moderate levels of severity for some of the parameters, particularly for the vibration and sensation parameters which in the first instance were questioned because the turbines were stationary. The identification of the concept of residents feeling or sensing the operation the windfarm was developed by the author following questioning of residents during testing with respect to the Waterloo Wind Farm in April to June 2013. For the Cape Bridgewater wind farm study “sensation” was included as a descriptor for assessing the subject wind farm. Comparing the wind farm data with the resident’s observation found changes in sensation were related to certain wind speeds that in turn were related to specific power outputs or change in power output of the windfarm. Sensation was found to give rise to the majority of the disturbances. Sensation when used as a tool for assessing impact found no relevance to the dB(A) level. When the infrasound was examined in terms of the slope for the amplitude of the narrowband analysis of the blade pass frequency, and harmonics of that frequency, there is a trend with the severity of the sensation. For the high severity ranking of 5, being a totally unacceptable ranking, an index has been derived being the dB(WTS) . 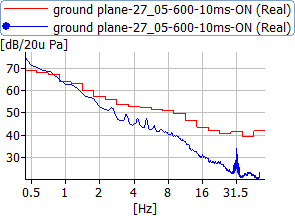 The measurement data for ON-OFF testing of the wind farm shows the infrasound spectrum for an operational wind farm has a harmonic relationship that does not occur in the natural environment. The study derived an acoustic parameter dB(WTS) that is related to the operation of the windfarm. On ignoring “sensation” the study found that none of the normal acoustic parameters are related to the operation of the windfarm, instead there is a strong correlation with the wind speed. As a result of the study the resident’s diaries would add “fatigue” and “pulsations in the head” to the description of sensation. The work undertaken at Cape Bridgewater was initially financed by the wind farm operator that specifically does not want to be identified. The initiative of the wind farm operator for taking a fresh approach to investigate the complaints and provided unlimited access to the wind farm and the data associated with the operation of the wind farm is acknowledged. Without the wind farm operator’s desire to undertake an investigation to look into the complaints of specific local residents with respect to the operation of the windfarm the work could not have been undertaken. Without question there is a grateful acknowledgement of the six residents who participated in the study. Their patience and persistent in providing diary observations (that at times occurred under extreme difficulties), the provision of access to their homes to undertake measurements, and all their time in discussing what they were reporting is acknowledged. Kelley N. D., McKenna H.E., Hemphill R.R, Etter C. L., Garrelts R. L. & Linn N. C. “Acoustic Noise Associated with the MOD-1 Wind Turbine: Its Source, Impact and Control, Soar Energy Research Institute, February 1985. Residents in proximity to the Cape Bridgewater Wind Farm have lodged complaints with the wind farm operator that the operation of the wind farm gives rise to noise and sleep disturbance that are not experienced when those residents are located at positions removed from the subject wind farm. The wind farm operator has identified that extensive acoustic monitoring external to residential receivers reveals compliance with the noise permit conditions that are expressed as an averaged A weighted noise level versus the hub height wind speed. The wind farm operator in conjunction with the Cape Bridgewater Community Consultation Committee have commenced noise monitoring at three residential dwellings where equipment is to be utilised to measure noise levels external to and inside the dwelling. 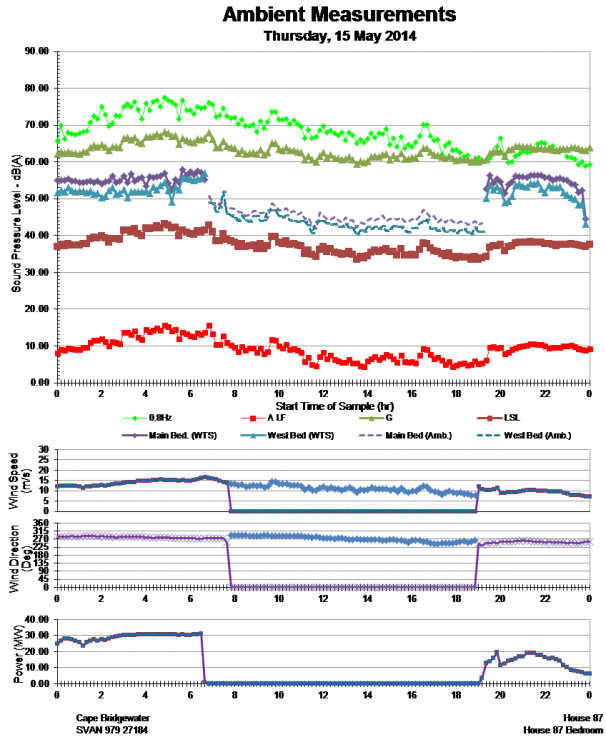 Noise logging equipment records the A-weighted level and 1/3 octave bands. The noise logging is to be conducted over an eight week period (subject to weather) that includes a two week period during which there may be potential shutdown or partial shutdown of the wind farm, as result of work being undertaken on the electrical cabling distribution system. As part of the noise monitoring, the occupants have been requested to provide comments in a diary format as to any disturbance/perception that may be experienced during the monitoring program. These diary comments are an essential component in an attempt to correlate the disturbances with respect to the operation of the wind farm in terms of general acoustic criteria, and/or any modification of such criteria that may arise from the monitoring results. Separate to the overall noise logging and monitoring a more detailed acoustical analysis/instrumentation is to be used in the three houses to assist in identifying/qualifying the acoustic environment and the transmission loss of the building envelopes from outside to inside. A daily journal concept was originally proposed to utilise the format prepared by the South Australian EPA with respect to the Waterloo wind farm study. Prior to conducting the subject testing, initial use by residents of the SA EPA diary format found the diary notation to be confusing/difficult. This was particularly so with the description as to the occurrence of the noise, which in some respects becomes irrelevant if persons are not there all the time. The residents felt the SA EPA method would lead to some people abandoning the use of the diary. A review and discussion of the preliminary noise diaries with the residents lead to a modified format to be used for the subject exercise. In discussing the impacts from the wind farm perceived by residents it has been identified that for some residents there are three different types of impacts which now been nominated as occurring under a heading of “Noise”, “Vibration” and “Sensation”. Providing a classification in the three groupings will overcome an issue in the SA EPA concept of only identifying in the noise diary matters relating to audible noise. A review of the diary observations versus the noise measurements reveals all the residents (who have experienced wind farm “noise” over a number of years) were observing changes in the impact and not identifying the impact during the remainder of the time. The instructions for observations are to identify any changes in impact as well as providing observations of the impacts/perception on a regular basis (1 or 2 hourly if possible). The diary to be filled in by the residents sets out their perception of disturbance and provides a record of all disturbances observed by the residents during the course of the noise monitoring. As the diaries are to operate throughout the entire period it is noted that residents may not be present for the entire 24 hours and therefore the diary comments do not necessarily identify the entire impact that may occur during the survey period. The intent of the diary is to provide a ranking of noise, vibration and sensation with respect to a simplified code that will then be correlated with the noise results and the analysis to determine if there are any repeatable patterns and/or disturbance relevant to the operation of the wind farm, prevailing weather conditions etc. Slight impact (Non-intrusive) Noise can be heard, but does not cause any change in behaviour or attitude, e.g. turning up volume of television; speaking more loudly; closing windows. Can slightly effect character of the area but not such that there is a perceived change in the quality of life. Moderate Impact (Intrusive) Noise can be heard and causes small changes in behaviour and/or attitude, e.g. turning up volume of television: speaking more loudly; closing windows. Potential for non-awakening sleep disturbance. Affects the character of the area such as there is a perceived change in the quality of life. Substantial Impact (Disruptive) Causes a material change in behaviour and/or attitude, e.g. avoiding certain activities during periods of intrusion. Potential for sleep disturbance resulting in difficulty in getting to sleep, premature awakening and difficulty getting back to sleep. Quality of life diminished due to change in character of the area. Severe Impact (Physically Harmful) Significant changes in behaviour and/or inability to mitigate effect of noise leading to psychological stress or physiological effects, e.g. regular sleep deprivation/awakening: loss of appetite, significant, medically definable harm, e.g. noise induced hearing loss. NB In some case residents relate severity 5 to be equivalent to having to leave their premises and go somewhere else because of the noise. In dealing with sensation (as reported by residents) there is a wider range of effects than that associated with the general concept of noise. The critical component (noise assessment wise) for the diary entries involves the date, the time and the severity classification for noise, vibration and sensitivity with column for comments that may be an explanation for any of the three parameters being diarised. The residents have been requested where possible to provide diary entries on a continuous basis (on a 1 hour or 2 hourly basis) and not just on changes in impacts. As the diary comments are to be electronically scanned and forwarded for correlation it is essential that the bottom of each page has a notation as to the page number and should include a reference letter/number allocated for the house for the purpose of a correlation of data but not in identifying the actual house. Posted on: 10 April 2017 . Category: Acoustics. Tags: Acoustical Society of America, ASA PIttsburgh, Cape Bridgewater Acoustic Investigation, Headaches, Home Abandonment, Nausea, Presssure in Head, Pressure in Chest, Pressure in Ears, Resident Diaries, Sensation, Steven Cooper, The Acoustic Group Pty Ltd.